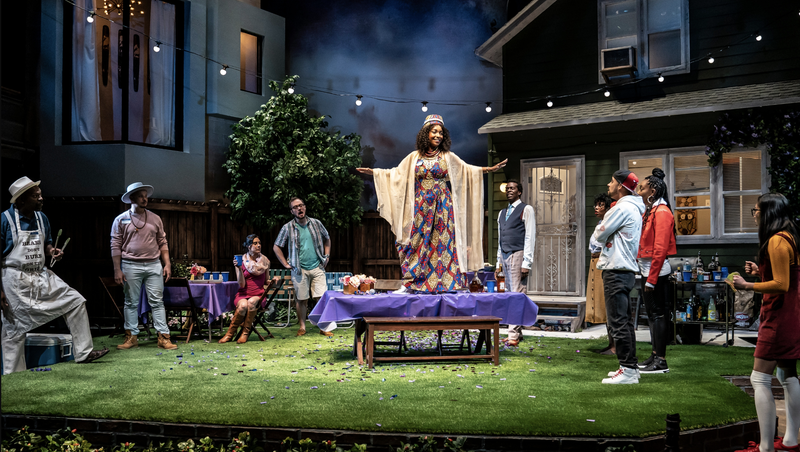 (l-r) James Vincent Meredith (Avery), Tony Santiago (Nunley), Michele Vazquez (Vivien), Pat Whalen (Ricky), J. Nicole Brooks (Mallory), Robert Cornelius (Robinson), Tommy Rivera-Vega (Ezekiel), Sydney Charles (Zora) and Aurora Adachi-Winter (Tori) in Lottery Day at the Goodman Theatre. Gentrification continues to redistrict the boundaries of traditionally black and brown neighborhoods in urban cities across America—inevitably, pushing longtime residents and their stories to the fringes in favor of glossier, more palatable facades and narratives. Those stories have been the focus of playwright Ike Holter’s stunning seven-play “Rightlynd Saga,” focusing on the inhabitants of Chicago’s fictional neighborhood of Rightlynd, in its swiftly gentrifying imaginary 51st ward (Chicago only having 50, in reality). Reuniting characters from six prior productions staged around the city (Rightlynd, Exit Strategy, Sender, Prowess, The Wolf at the End of the Block and Red Rex), as well as many of the actors who originated the roles, these local intersecting narratives collide in an explosive showdown with the Goodman Theatre’s world premiere of the saga’s final installment, Lottery Day. Directed by Chicago native Lili-Anne Brown, Lottery Day is a poignant and powerful reminder of those left behind in the aftermath of loss—of neighborhood, power, cultural identity, and family. From the play’s opening strains of Minnie Riperton’s “Memory Lane,” ending in a distortion of that iconic high note, it is clear all is not right in the world of Rightlynd, even as matriarch Mallory, the lone holdout on a gentrified block, prepares for a celebration. Played by J. Nicole Brooks (The Chi), the character is brash—at turns, impulsive, abrasive and affectionate—but ultimately, deeply broken by loss as she attempts to reconcile the past with her own perverse version of reparations. Rightlynd is a neighborhood scarred both by “broken windows” policing and what Mallory aptly terms “Gone with the Windows” infiltration by monied opportunists seeking a good deal. Case in point: next door neighbor and house flipper Vivien (hilariously portrayed by Michele Vazquez), the type of otherwise well-meaning, savior complex-ridden, white-presenting woman (though, in this instance, also a Latina) who proudly displays expensive African art on her walls but looks upon the black and brown people indigenous to her new enclave with disdain. “At all hours of the morning, I look out my windows and it looks like I’ve stumbled into the Source Awards,” Vivien at one point quips, casually lobbing a loaded mention of calling the police against longtime resident Mallory. It’s the type of behavior we’ve chronicled often here at The Root, and “Veiled Threat Vivien” is true to life in seeming only half oblivious to the very real potential consequences of that warning. “Now that this neighborhood is new, we have a responsibility to be better,” she later adds, eliciting a horrified groan from the audience. It’s this dynamic that sets the stage for Lottery Day’s assemblage of diverse, equally problematic yet well-developed characters; each attempting to find their own ways to cope and co-exist within Rightlynd’s shifting demographics and increasing disenfranchisement. Their conversations are raw, clever and often cacophonous as each jockeys for position in both Rightlynd and Mallory’s good graces, as she is quickly recognized as not only the matriarch of the gracious backyard where the action takes place, but also her embattled community. The partnering of Holter and Brown proves especially powerful in the Goodman’s production, as is their remarkable casting. There is an innate sense of knowing these characters—whether the tough but tender Zora (a standout performance by Sydney Charles), the snide and self-preserving Robinson (deftly played by Robert Cornelius) or the deeply complicated loyalty of Mallory’s dearest friend, Avery (played by Broadway, film and television veteran James Vincent Meredith). Lottery Day is in production at Chicago’s Goodman Theatre through April 28. Tickets are available here.